Aparthotel El Sesteo is located 11 km from the International Airport on a direct route which takes approximately 15 minutes to drive, and is two blocks south of La Sabana Park in a quiet residential area. There are restaurants, local and international banks, shopping, movie theaters and major businesses, all within easy walking distance. Buses stopping just a block and a half away take you into the city center in approximately five minutes. El Sesteo is a fully enclosed, two story building with secure covered parking. Both laundry service and washing-machines are available for the guests. 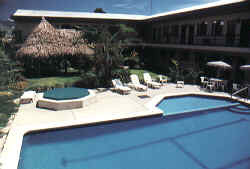 Their gardens and rancho in the central pool area are very famous for its tropical atmosphere. They have a membership with the Costa Rican Tennis Club which allows our guests to use their facilities like tennis, bowling, three swimming pools, gymnasium and sauna, for a small charge. The Aparthotel has a total of 36 units, of which 20 have fully equipped kitchens, dining and living areas, and separate bedroom and bath. 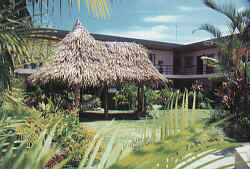 The remaining 16 units are hotel style bedrooms with bath. These 16 units have doors adjoining them to the kitchens to accommodate larger groups and families. All rooms have ceiling fans and are light and airy. 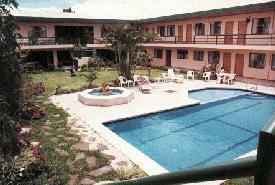 The bedrooms have cable TV with remote control, direct-dial telephones and one queen sized or two twin beds. Rates include continental breakfast and food is served upon request. They serve a free continental breakfast. Their new service includes free internet service and a small meeting-room (about 12 people). Extra person $17.00 + taxes. Children from 10 years old and under free of charge. Maximum 2 children per room. Ask for special corporate and group rates.